There are some winning combinations in the land of baked goods. Peanut butter and bananas? Count me in. Chocolate and peanut butter? Of course. All three? You’ve GOT to be kidding me. 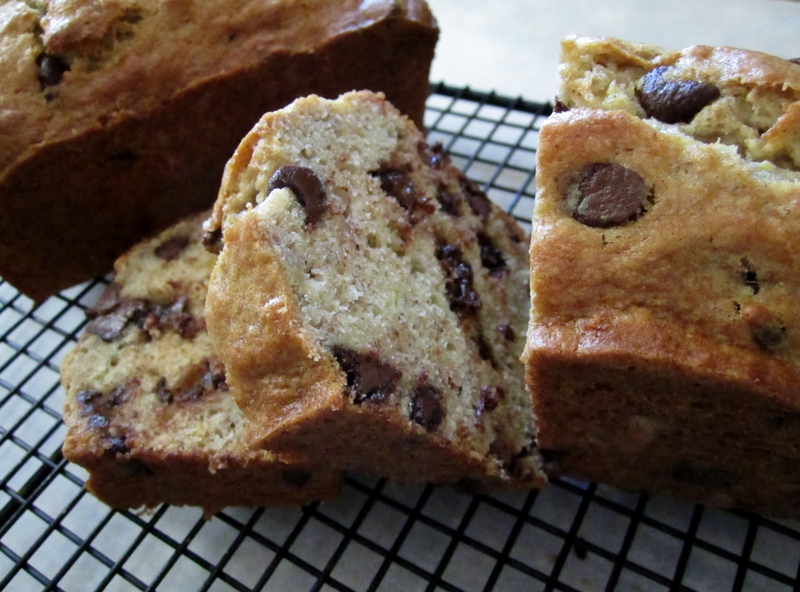 I’ve been making this banana bread in some form or another for at least six years now; it was actually one of the first recipes I tried that got me into baking back in high school. 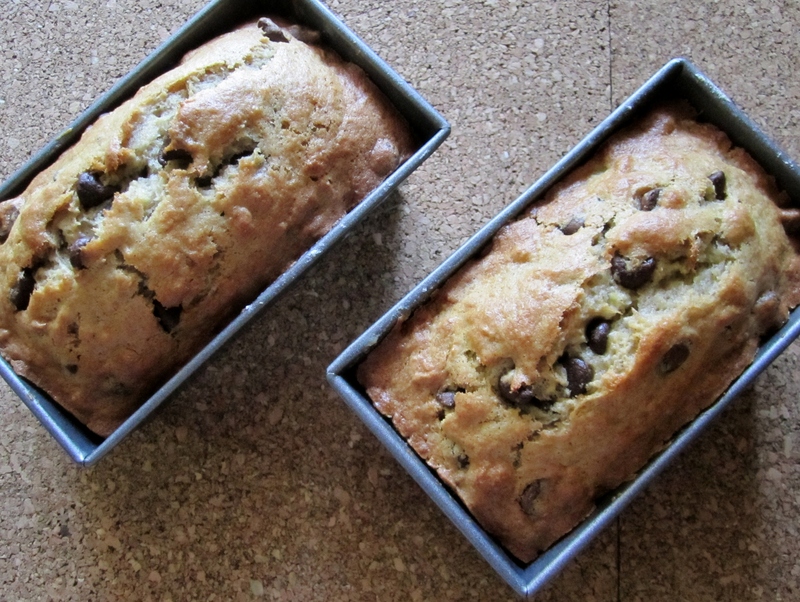 Banana bread is the one banana food I love more than fresh bananas, but I have such a hard time keeping bananas around long enough to let them get overripe. I have to make it a point to buy a truly unreasonable amount just to have some left over after a week or so, but it’s always worth it. Anyway, back to the indulgent triple threat that is this recipe. I know a recipe is good when someone takes that first bite, chews a bit, and I see their eyes go wide with that “what on earth did you just feed me and can I have all of it right now” look. That’s my favorite look. I got a very encouraging number of those faces with this bread, and I definitely had the exact same reaction. My favorite part of this bread is the top crust. I know it’s pretty typical to love the muffin tops and the brownie edges and everything, but this crust feels special – it gets really wonderfully crisp, not gooey like a lot of breads. I also really love how the lemon zest and cinnamon balance each other out, adding both warmth and a bit of zing, but nothing to detract from the stars of this show. I usually make this bread in a standard full-size loaf pan, but I opted to split this batter into two mini loaves so I could have a “keep one, share one” situation. If you opt to make a single loaf, it will take a bit longer to bake (60 to 75 minutes) but nothing else needs to be changed. I kept the peanut butter icing off of the bread in the photos because I think it stores better separately – and because I like the option to slather my slice in as much peanut buttery goodness as I want. If you want to drizzle it on top, I’d recommend thinning the icing with a bit more milk. In a separate bowl, lightly beat egg. Whisk in the banana, sugar, butter, cinnamon, nutmeg and lemon zest. Add wet ingredients to flour mixture and stir just until combined. Fold in chocolate chips. Spread batter in two greased and floured loaf pans. Run a toothpick or the tip of a butter knife along the batter, lengthwise if you’d like that photogenic center crack once it’s baked. Bake for 40-50 minutes, or until tops are golden and a toothpick comes out clean. Cool for fifteen minutes in the pan before moving to a wire rack. Combine the confectioners’ sugar, peanut butter, vanilla extract, and one tablespoon of milk and begin to whisk – add milk one tablespoon at a time until your icing is at the desired consistency. 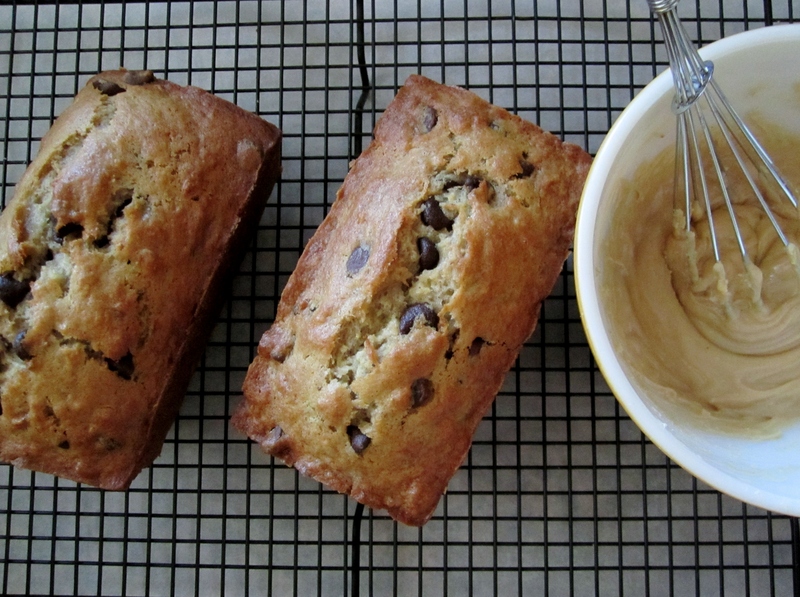 Drizzle over bread or store in an airtight container for icing slices individually.